Castillo Serrallés was built as the exclusive residence of Don Juan Eugenio Serrallés, a sugar cane plantation owner during the early part of the 20th century. The structure sits on 2.5 acres of exceedingly manicured property, and it overlooks the downtown area of Ponce, Puerto Rico. This photo was taken shortly after the mansion was built. The impoverished shacks say a great deal about the structure of Puerto Rican society. This society was engineered by large U.S. sugar corporations, and a small group of wealthy Puerto Ricans who did business with them. The sugar cane workers worked six days a week for the Serrallés family, for about $1.50 per day. 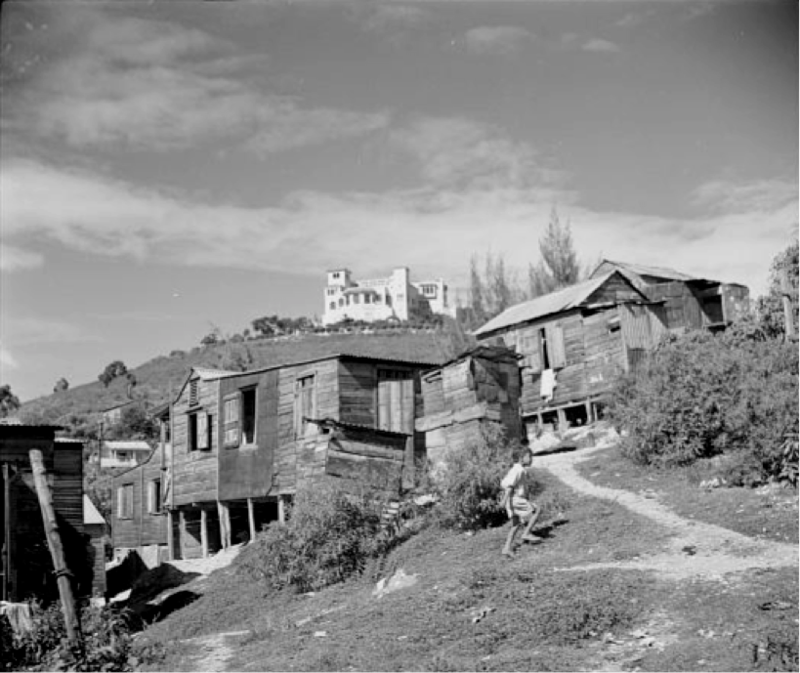 In the foreground of the photo, are the shacks where some of them lived. I knew this was coming but not this fast. So who is next the Jewish people? How many more people and nations is this Trump going to hurt? That is an important part of the story…one which I did not know. It’s 2:18 in the morning of Thursday August 27 2015. I just read this article. So I felt that I had to respond with a comment to clarify who the Serralles family were really. This family was not some one to reckon with. They were one of the largest trafficker and owners of Black African slaves. In Ponce alone they owned over 300 Black slaves. They tried to tear down the other agriculture farmers so that they could built a bigger sugar cane industry. Their workers lived in a deplorable condition. If you don’t understand what I’m saying look up the archives books on slave ownership . You will find out they were one of the biggest. We most continue to study our history and speak with our elders to find and correct the lies that have been written. RICOS DESDE LA EXISTENCIA DE PUERTO RICO… PERO AYUDARON MUCHO AL POBRE DANDOLE TRABAJO. Indeed there was income inequality at that time as well as today. This does not surprise one bit and things haven’t change very much either in 118 yrs of occupation. … and the “Serralles Castle” still stands …. in all its glory! !